Many people know the pain of losing a premature baby or possibly a baby who is stillborn. When these unthinkable situations occur, the family looks for ways to ease the pain. Our church hopes we can help love these families in a special way. A group of ladies called "smocking angels" assemble at our church to smock and sew outfits for the lost babies. It was brought to our attention by our former youth minister, who is now working as one of the chaplains at Wake Medical Center, that the babies needed outfits in which to be buried. The group leader is our Outreach chairperson, Patricia Hollowell, who has made christening gowns for many years. The invitation went out to the community that a class was being formed to smock and sew the outfits for the hospitals. Several ladies from other churches as well as some from Divine Street answered the call. The group of participants range in age from 24 to 90. Anyone interested is welcome to join the team. The gowns are continuously being made and delivered to Wake Medical Center (3 locations in Wake County) and now also for Betsy Johnson Hospital in Dunn, NC. A total of 105 gowns were delivered to both hospitals during 2016, and those numbers continue to grow. Additional hospitals will be served as the needs are identified. Before each delivery, the gowns receive a blessing from our minister to provide some much needed relief to the bereaved parents and families. As resources become available, both materials and smockers, this mission could be expanded to other local hospitals. Donations of money, lace, notions and material (please check with the group leader for types) would be most appreciated. Contact person: Patricia Hollowell. Our local need for food is never-ending, and DSUMC works to support our area food pantry through donations of non-perishable food items. Collections are received throughout the year and delivered to the Dunn United Ministerial Association Food Pantry (DUMA) Food Pantry at 319 W. Broad Street in Dunn. We have a cabinet inside our courtyard entryway for collections. ​We also set aside one Sunday in December as our "White Christmas" celebration. On this Sunday, food is brought to the church in white packaging which is then delivered to the DUMA Food Pantry. Contact person: Hank Bethea. Throughout the year, our Care Team visits, sends cards, delivers flowers and reaches out to our Divine Street community. We especially concentrate on those who are homebound or struggling with health. Contact person: Joanne Taylor. We are currently in the process of setting up teams of friends for visits to those who are homebound. Contact persons: Joanne Taylor and Huntsie Strickland. DSUMC volunteers show up twice a month to lend a hand in distributing food items to folks in need. The DUMA Food Pantry is open twice a month (2nd & 4th Tuesdays). Contact person: Hank Bethea. Seasonal clothing is collected all year long in support of the Beacon Shelter and Thrift Store. Our donations help to clothe those in need. Any items which are not needed right away are located in the thrift shop, and proceeds are returned to help fund the shelter. Contact person: Susan Smith. Often folks stop by DSUMC needing food to get them through the day. On days when the DUMA Food Pantry is closed, we offer a small bag of lunch-type items with a bottled water. Contact person: Dennis Hollowell. During the week prior to Thanksgiving, our church joins together to provide a full-blown Thanksgiving feast with all the trimmings. We invite the families from the Beacon Shelter to sit around tables and share the meal with us. It's a highlight of the season! Children at Wayne Avenue Elementary School are recommended to us each December, and we work to provide Christmas gifts for each child. From socks to bicycles, anything is possible, and DSUMC wants every child to experience the wonder of Christmas! Contact person: Susie Creel. Johnson Better Care Facility is an assisted living facility here in Dunn which offers independent and daily support services. This year at Easter, we will provide gift bags with personal care items and socks. Each year in December, we provide gift bags and Christmas stockings for the residents. Many of our friends here may have limited resources or visitors and we love sharing and visiting! Contact person: Joanne Taylor. During times of natural disaster, we work to create and deliver hygiene kits. Most recently, we were able to deliver over 200 kits to folks in the Houston area following Hurricane Harvey. Contact person: Beth Gaines. When people in our area are struggling with illness or other difficult situations, our team reaches out with a hand-crafted prayer shawl. The comfort these shawls offer is immeasurable as those who receive them know they are loved and prayed for constantly. All levels of knitting and crocheting skills are welcome, and beginners are often mentored in the craft by our resident experts. Contact person: Barbara Bethea. At the beginning of each semester, our United Methodist Women's group gathers needed school supplies for the children at Wayne Avenue Elementary School. A list of needs is provided by the teachers and councilors at the school. Contact person: Caroline Wilson. Visiting in the prisons is a specific need identified by Jesus. This rewarding Bible Study ministry changes lives and helps those who are incarcerated to recognize the hope that comes through the Love of Christ. Contact person: Gary Ronnfeldt. At the beginning of each academic school year, DSUMC joins hundreds of vendors and exhibitors at the Campbell University Street Fair in welcoming students back to classes. We greet others, offer a smile and friendly face, hand out goodies, and invite folks to make Divine Street their home-away-from-home church. Go Camels! Each spring, we gather with other churches, schools, sports teams, businesses and civic groups in our area to raise funds and package meals which are then shipped to areas of need around the world. 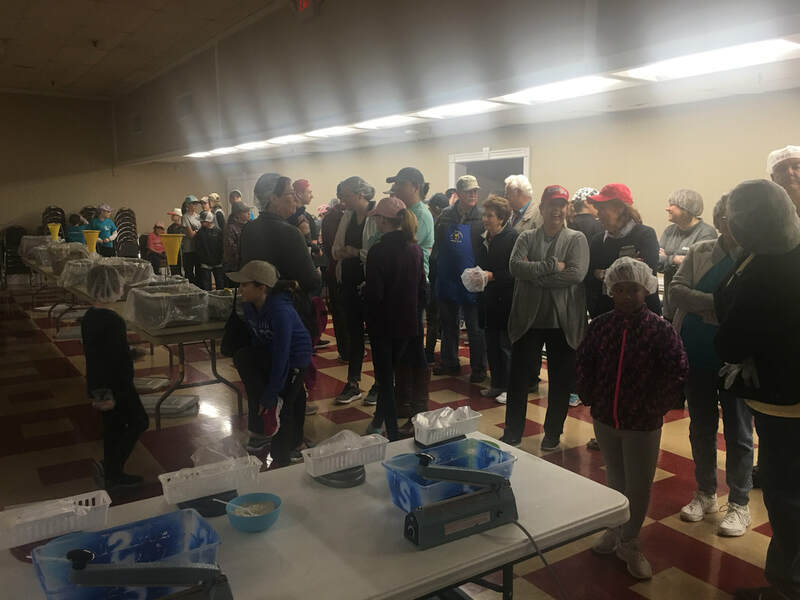 In 2018, over 400 people gathered to package 85,000 meals. In 2019, 711 people gathered to package over 110,000 meals! Contact person: Barbara Bethea.